Barcelona celebrated boss Luis Enrique's 100th match in charge with a laboured win over Levante to go three points clear at the top of La Liga. They went ahead against the run of play when David Navarro turned Jordi Alba's cross into his own net. Luis Suarez's 20th league goal of the season sealed the points. 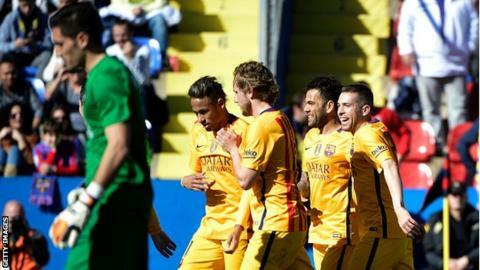 Match ends, Levante 0, Barcelona 2. Second Half ends, Levante 0, Barcelona 2. Goal! Levante 0, Barcelona 2. Luis Suárez (Barcelona) right footed shot from the centre of the box to the bottom left corner. Assisted by Lionel Messi following a fast break. Toño (Levante) wins a free kick on the left wing. Foul by Simao Mate (Levante). Attempt blocked. Jefferson Lerma (Levante) right footed shot from outside the box is blocked. Assisted by Víctor Camarasa. Corner, Barcelona. Conceded by Víctor Camarasa. Iván López (Levante) is shown the yellow card for a bad foul. Foul by Iván López (Levante). Foul by Giuseppe Rossi (Levante). Substitution, Levante. Mauricio Cuero replaces Verza. Attempt missed. Neymar (Barcelona) right footed shot from outside the box is high and wide to the right. Assisted by Jordi Alba. Substitution, Barcelona. Aleix Vidal replaces Dani Alves. Substitution, Levante. Víctor Camarasa replaces Deyverson. Substitution, Levante. Nabil Ghilas replaces David Navarro. Substitution, Barcelona. Sergio Busquets replaces Ivan Rakitic. Jefferson Lerma (Levante) is shown the yellow card for a bad foul. Attempt saved. Deyverson (Levante) header from the centre of the box is saved in the top centre of the goal. Assisted by Giuseppe Rossi. Deyverson (Levante) wins a free kick on the left wing. Attempt saved. Ivan Rakitic (Barcelona) header from the right side of the six yard box is saved in the top centre of the goal. Assisted by Neymar with a cross.